1 Place prepared chili peppers, garlic, ginger, and cilantro in a blender. Coarsely chop 6 sprigs of mint and tarragon, reserving the remaining sprigs for garnish. Add the chopped mint and tarragon to the mixture in the blender. Blend into a thick puree. Pour into two small bowls (one for marinade and one to serve), season with salt and pepper, stirring to incorporate. 2 Rinse the lamb chops under cold running water. Pat dry with paper towels. 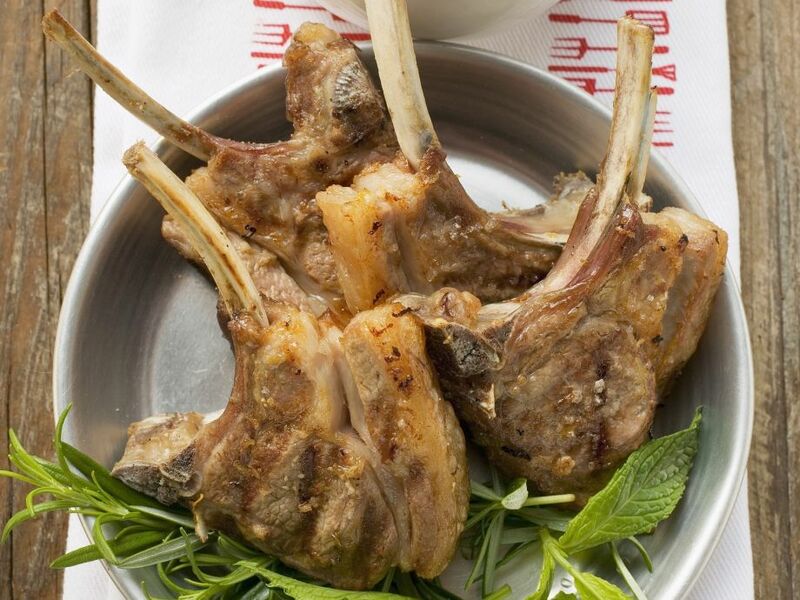 Brush both sides of the lamb chops with herb sauce. Cover tightly and marinate for at least two hours. 3 Prepare grill for direct grilling. Preheat to medium-high. 4 Brush the grill grate with oil. Place marinated chops on the hot grate and grill until cooked to taste, about 4 to 6 minutes per side for medium-rare. 5 Transfer chops to a serving platter or individual plates and let rest for 3 minutes. Serve with reserved herb sauce, and garnish with fresh mint and tarragon sprigs.